Our thermographic inspection services could save you thousands of dollars. Call us to find out how! Montreal home renovation company, Les Experts Innovateurs specializes in residential renovations and home extensions in and around Montreal. You’ll be able to find a vast list of services to choose from that will fit what you’re looking for from any type of household renovation to extensions. 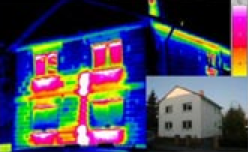 We offer the latest technology using infrared cameras for energy loss diagnostics. Les Experts Innovateurs employs only specialists that don’t think that speed and excellent work are antonyms.